Potty training is a big deal for both parents and children. It’s an exciting next stage in their development and provides the parents with more freedom since diapers, wipes and lotions won’t need to be carted around once the child has mastered using the bathroom. Research was conducted on the most popular potty chairs on the market to find the best of the best. The three top rated potty chairs listed here top the charts in durability, stability, design, features, popularity with parents and children, and many other categories. Any one of them would make an excellent potty chair for your child. There are a few things that you will want to invest in before you start the potty training process. The most important of these items is the potty chair. Using an adult toilet can be really scary for a child, especially since the child is so small that they have to balance precariously on the edge or risk falling in. For this reason, it is much better and easier to potty train your child by getting a potty chair that is their size. It provides the child with a lot of independence since they can sit down and stand up on their own without having to balance and they don’t have to be afraid of falling in. Potty chairs come in a variety of sizes, styles and even colors. With all of these choices available, knowing what to look for can be a big help in sorting through them all. We have provided you with the tools you need to find the best potty chair for your child that will help them be successful in their potty training journey. BABYBJORN is a well known name of quality baby products. Parents know and trust this brand which is why this potty chair is so popular. Emptying the potty is very convenient and easy, just lift out the inner potty seat and clean it out. It is the perfect product to help your child go from diapers to wearing regular underwear. There is plenty of room for their legs and their feet can be securely on the floor even if they are just starting out learning. 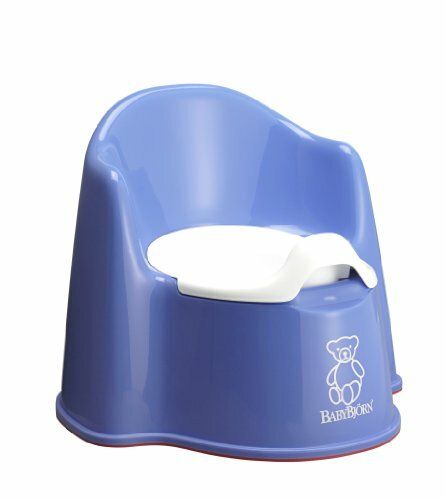 The BABYBJORN child’s potty chair is made from BPA free plastic and meets safety standards not only in the USA but in Europe as well. The smooth, rounded design of the potty chair will not cause any painful pinches that will cause the child to not want to use it. There are no corners or grooves in this seat where bacteria and dirt can build up. The bottom of the potty chair has a rubber edge along the bottom so it is skid-free and secure when the child is sitting down and standing up. 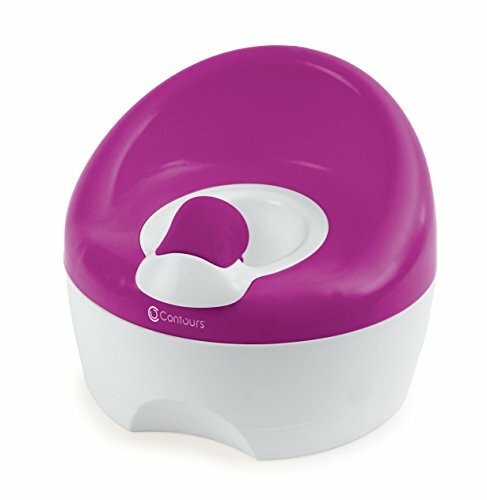 Contours is one of the baby product icon companies that parents love and look for whenever they are purchasing baby supplies. This Contours “Learn-to-Flush potty chair not only helps your child transition from diapers to potty, it teaches something very few if any other potty chairs do and that is to teach them how to flush the toilet too. There are a lot of real life, adult, potty like elements with this potty that parents and children love. It actually has pretend water that twirls around and makes a real flushing sound so little ones get used to the sounds that big potties use. There are also fun sounds and lights that reward the child when they successfully use the child’s potty chair. It has a removable potty ring that can also be used on a regular, adult sized toilet. It is the perfect height for the child just getting started with potty training and has smooth edges, a splash guard and other great features that make kids love it just as much as that adults love getting it for them. Another style of potty chair that parents like is one that allows the child to use a step stool to get to the adult potty. Then there is a child size seat attached to the steps that the child can sit on. This step up potty chair needs no tools for assembly and can fold up for easy storing when not in use. The floor pads are extra wide and non-skid as well. It has non-skid handles as well that the child can safely hold onto while they are climbing up and down. 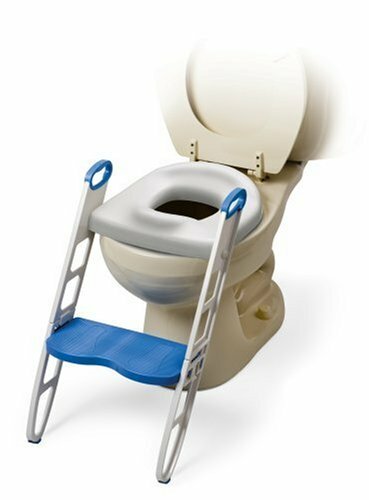 This uniquely designed potty step up chair fits standard toilets as well as most elongated models as well. The contoured seat is padded and comfortable and it comes with a built-in splash guard for little boys. Clean up is a breeze. All it takes is wiping with mild soap and water and it’s clean and sanitary as well. This is a great potty for helping children transition from wearing diapers to using a big boy or girl potty. It provides all the comfort the child needs and the security too. There are several things that you should look at when you are looking for the perfect potty chair. Since you don’t want to end up purchasing several potty chairs because the first couple of chairs aren’t right, it is important that you know what to look for ahead of time. This will save you time and money and will assure you of choosing the potty chair that will be perfect for your child. The three potty chairs we have reviewed above are all customer favorites for many reasons including comfort, ease of use, construction and brand name reputation. All three of them have excellent construction that provides the security and stability that your child needs so the potty training experience is a positive one from beginning to end. To learn more about choosing the right potty chair for your child, read the buyer’s guide below. This guide has plenty of information on what to look for and the differences between the different potty chairs so you can compare them and choose the best one for your child’s needs. There are two types of potty chairs on the market to choose from. These two choices are the free standing potty that sits on the floor and works for children 18 months to 3 years of age and the kid size potty seat that fits over the adult toilet. Each one has pros and cons that we will list for you below. This portable potty chair can be used in any room you choose so the child doesn’t have to make a mad dash to the bathroom when the urge hits them. When children are first learning to use the big toilet, they sometimes will ignore the signs until they have to run. If they have to reach a bathroom that is across the house from where they are, chances of an accident are pretty big which can be a real source of frustration for the child. Having a freestanding potty chair means you can set it up in the bedroom if you are in there with your child, the back hall, den…even the kitchen if you choose. Once they start recognizing the signs better you can move their freestanding potty to the bathroom so they understand that they need to do their business in the bathroom and not just anywhere the mood hits. The freestanding potty is lightweight and you can travel with it easily and even taking it on camping trips. It is the perfect size for a child without worrying about them falling in or being scared by the loud flushing noises they may not be used to. A few of the things parents don’t like about potty chairs is that it is made of plastic and doesn’t really do anything to blend in with the existing décor. It is simple in design and they are not made with decorating and furnishings in mind. Some parents don’t like having to dump the small inner potty and having to clean it each time, but for the child that has a fear of the large toilet, this freestanding potty could be the difference between them learning to use the bathroom and remaining in diapers far longer than they need to. A removable potty seat for the next stage of training and transitioning to the big potty. This type of potty training method can either be a set of steps that has a kid sized potty seat that fits over the larger one, or it can just be the seat that can be taken off when the adult needs to use the bathroom and replaced for the child. If your little one loves being big like mommy or daddy, this type of potty chair is perfect because they get to use the big potty without the worry or fear of falling in. Other benefits include the room they save by just sitting on top of the adult toilet rather than having to take up a space on the floor. It can also be taken on trips (after being cleaned and being put in a plastic bag) and kept in the suitcase. It can also move from bathroom to bathroom as necessary and there is no extra potty bowl to dump or clean. A few of the drawbacks to this type of potty chair is that it does have to be moved when other family members need to use the bathroom. This can be inconvenient if there are a lot of people using the bathroom. In the event that this is a frequent occurrence due to having a large family, teach the child as early as possible how to place the kid sized seat on top before they climb up to sit down. Non skid potty seat that lies on top of the adult toilet seat securely without shifting and scaring the little one. There are some extra things that you can do to encourage your child to transition from diapers to the potty chair. These tips and suggestions can make potty training something your child actually looks forward to rather than something they avoid. If you’re using a potty chair, give your child a little space in the bathroom that is theirs. Make sure it has their own roll of toilet paper within easy access of their potty chair so they don’t have to stand up and get the roll from somewhere else. Set up a little entertainment box that has children’s books and a few little toys to keep their attention if they need to sit for longer than a minute or two. Sitting and reading on the potty is a great way to teach them because they stop concentrating on doing something in the potty and pay attention to the book. This change in focus can make it much easier for them to do what they are supposed to do in the potty. Make sure there is a step stool within reach where they can wash their hands after using the potty. Purchase some kid sized liquid soap to encourage always washing their hands. Provide a little treat bucket after they have been successful at using the potty. After they have used the potty and washed their hands, they are allowed to come to the treat/reward bucket and pick a treat. Include them in the selection process. If they get to choose their own potty chair they are going to be anxious to “try it out”. Allow them to choose their first package of big boy or girl underwear. They may be so excited to wear their big boy or girl underwear that the potty training process becomes super easy. The potty training process is different for every child that embarks on this journey. Each child will be ready to potty train at a different age so don’t start pressuring them to potty train before they are ready unless they are getting close to school age. (4 and above) Some children are ready right at 2 years of age and some, it takes a little longer. Having the right potty chair can make a big difference in how your child views potty training. If you get them a couple of books on the subject, involve them in the potty selection process and give them a great little space that their potty can go that is set up with toilet paper, books and more, they will likely be very interested in trying out this new way of using the bathroom.